Quick overview: How to ensure that the SMARTBoard accurately registers where you press with your finger or a pen. Beginner technique. How can it be used in the classroom: As a rule of thumb, I highly recommend that you calibrate your SMARTboard before EACH class. 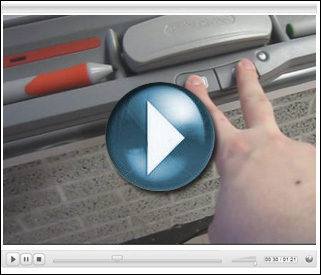 This quick and easy procedure (literally just a few seconds) will ensure that your SMARTBoard accurately registers where you press with your finger or pen during a presentation. An uncalibrated board will make it difficult for you to move around small objects or manipulate toolbars. A SMARTBoard will become uncalibrated if your digital projector or SMARTBoard is moved even a fraction of a inch! This entry was posted in IWB and tagged calibrate, decalibrated, iwb, smart board, SMARTBoard, uncalibrated, v for victory, victory. Bookmark the permalink.